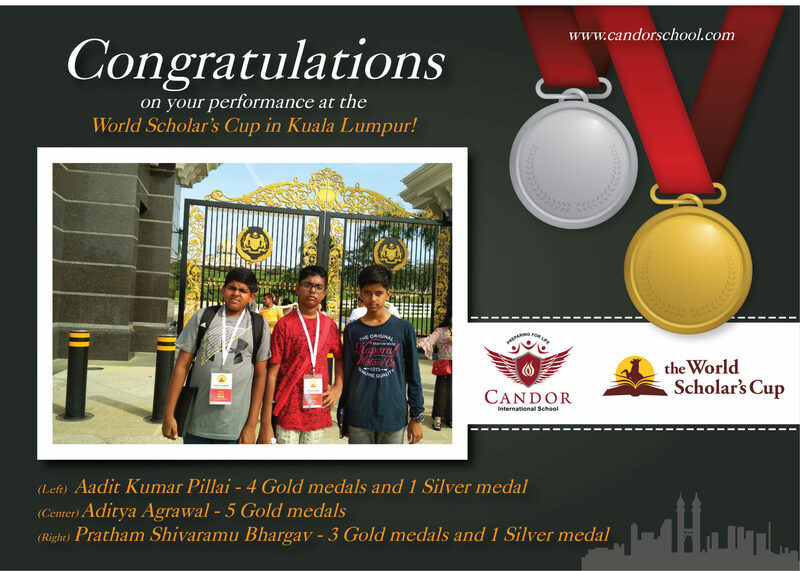 A team of three students – Aadit Kumar Pillai, Aditya Agrawal and Pratham Shivaramu Bhargav – from Grade 7 of Candor International School qualified for the global round of the World Scholar’s Cup. The Global Round was held at Kuala Lumpur, Malaysia from June 18 – June 22, 2018. The event was one of the most attended event in the history of the World Scholar’s Cup – Global Round, with approximately 4,000 scholars from about 50 countries marking their presence. The hectic schedule was tiring yet rewarding in more ways than one. Over the 4 days, the students competed, participated in quizzes, socialized, toured Kuala Lumpur and made friends from around the world. The event began with a grand opening ceremony, with well-known author Gary Turk presiding as the Chief Guest. This was followed by the Scholar’s Scavenge, where students from various nationalities/teams were grouped together to complete certain tasks. This event took place at the Sunway Lagoon in Kuala Lumpur. The second day commenced with two of the four academic events of the championship: The Scholar’s Challenge which consisted of multiple choice questions based on the World Scholar’s Cup curriculum; and Collaborative Writing which tested individual essay writing in collaboration with the team. After these challenging events, students went on to demonstrate their debating skills at the Team Debate event. Each team debated on three motions related to the World Scholar’s Cup theme. The following day started with Scholar’s Bowl – a quiz based on the World Scholar’s Cup curriculum. This was followed by the Scholar’s Show – a talent show where students performed in front of the huge audience. The day ended with the Scholar’s Ball, where scholars danced their fatigue away to some grooving music. The fourth day was the day for some sight-seeing, with tours organized for the junior division scholars. Students visited attractions in Kuala Lumpur such as the Butterfly Park, an art gallery, King’s Palace, Kuala Lumpur Tower, and had a lavish lunch at the revolving restaurant at the KL Tower. The evening was reserved for the Scholar’s Cultural Fair, where countries put up their stalls, and scholars gave a glimpse of their cultures wearing traditional outfits and offering local delicacies to taste. The last day began with the Scholar’s Show, displaying some more splendid performances by the scholars. After the farewell lunch, it was time for the awards ceremony followed by the closing ceremony. The scholar’s experienced mixed feelings of happiness at having performed well at the event, and sadness at the completion of a great experience and exchange. The biggest take away for students was the exchange of cultures and ideas from around the world. However, their academic performance and the medals they won was like the cherry on the cake. The total medal count for Candor International School stands at a whopping 12 gold medals and 2 silver medals, in various categories, amongst only three students. Congratulations to the Candor team on their haul! Well done to the kids for representing Candor on the global stage!